Built 1884 as "Empire Theatre" by Thomas Verity, and J. and A. E. Bull as a conversion of the 1865 "Royal London Panorama". 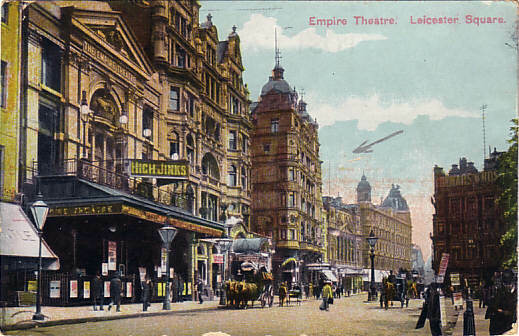 1887 renamed "Empire Theatre of Varieties". 1898 again renamed "Empire". 1899 new foyer and entrance by Frank Verity. 1904 major rebuilding by Frank Verity. Closed 1927. 1928 major rebuilding, conversion into the "Empire" cinema by Thomas W. Lamb and F. G. M. Chancellor. 1962 major rebuilding as cinema and ballroom by George Coles, including the Ritz cinema next door as a second auditorium with a common entrance. Currently used as a cinema. 1330 seats. 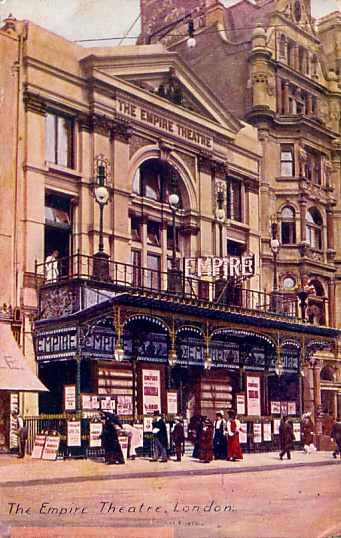 Front Text: "The Empire Theatre, London", inscription: "The Empire Theatre", signs: "Empire"
Front Text: "Empire Theatre, Leicester Square", inscription on building: "Empire Theatre", sign: "High Jinks"
Front Text: "Leicester Square, London. This well-known square is in one of the gayest quarters of the West End of London. 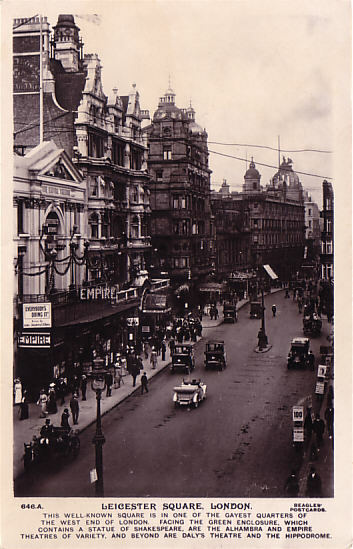 Facing the green enclosure, which contains a statue of Shakespeare, are the Alhambra and Empire Theatres of Variety, and beyond are Daly's Theatre and the Hippodrome." For anothe picture of this theatre, see London: Alhambra Theatre.